The Coalition of United Political Parties (CUPP) says by refusing to sign the electoral amendment bill into law, President Muhammadu Buhari is willing to plunge the country into crisis. Buhari said an amendment to the law close to the election period may provide an opportunity for disruption and confusion in respect of which law governs the electoral process. But in a statement on Friday, Ikenga Ugochinyere, CUPP spokesman, said the president “expectedly failed” to take advantage to write his name in gold by signing the bill. Declining to assent to the bill, he said, was an act of “clear desperation” on the president’s path. “For each of the four times the Electoral Amendment Bill was presented to him for assent, he waited until the last day of his constitutionally allowed 30 days,” the statement read. “Nigerians should also be reminded that throughout the amendment process, President Buhari never made any suggestions or proposals to the national assembly for the improvement of our electoral process but kept delaying and indulging in unnecessary hide and seek until this last minute. “Rather, the president is willing to allow Nigeria witness her most violent elections when he had opportunity to sign the law which guarantees the freest and most credible elections in Nigeria’s history. 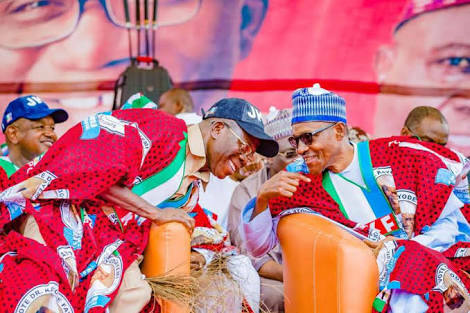 “The entire plan of the APC as we had revealed in earlier communications to the media is how to steal the mandate of the people to perpetuate a failed government in power. “Nigerians have had enough of the Buhari misfortune and are resolved on consigning it to history where generations shall be taught on the kind of persons not to be elected President in any country ever again. President Buhari by all indications is willing to plunge Nigeria into electoral crisis worse than those that twice directly led to the collapse of democracy after the 1963 and 1983 general elections. Ugochinyere called on Mahmoud Yakubu, chairman of the Independent National Electoral Commission (INEC), to resist any attempt to rig the 2019 polls.